For the American soccer player, see Shaun Higgins (soccer). 1 Playing statistics correct to the end of round 5, 2019. 2 State and international statistics correct as of 2017. Shaun Higgins (born 4 March 1988) is professional Australian rules footballer playing for the North Melbourne Football Club in the Australian Football League (AFL). He previously played for the Western Bulldogs from 2006 to 2014. Higgins is a dual Syd Barker Medallist and was selected in the 2018 All-Australian team. He received a nomination for the 2007 AFL Rising Star award in round 8 of the 2007 season. Higgins was the Geelong Falcons best onballer and was projected to go higher than pick 11, but fell in the lap of the Western Bulldogs. Ahead of him were players such as Dale Thomas, Pendlebury and Marc Murphy. He was named in the 2005 TAC Cup team of the year. He managed to make his debut in his first season, against Collingwood. He played mostly as a small forward then but suffered a season-ending elbow injury in round 13 against the West Coast Eagles, ruling him out of that year's finals campaign. Before his injury he showed flashes of brilliance in front of goals. But his fitness levels were not quite up. But even at that stage he was a standout with his accurate kicking and awareness of what was around him. With the frustration of missing his first season, This was Higgins' breakout year after coming off a season ending elbow injury. He proved a handy Goal Kicker up forward that could take a good mark and set up players for a Goal. This was the year where the doubters got off his back and found out just how good he really was, and proved what kind of prospect he is. The game most notable was against the team he made his debut against, Collingwood where he kicked the Winning Goal. He was the Round 8 nominee for the 2007 NAB Rising Star award. With a great win against Adelaide to open the season Higgins played a vital role in the win. His Season was cut short in round 2 with a Broken Ankle against Melbourne when he landed on it coming down from a Marking contest. It was only supposed to keep him our for a few weeks but the injury was worse than first thought. But came back to play in the Finals. Higgins learned a valuable lesson that year and it has made him a better Footballer. When he was injured he was always in the Bulldogs rooms encouraging his team mates and this was the first sign of Leadership that he shown and he later was voted by his peers as a leader. In the preliminary Final against Geelong Higgins was playing on Darren Milburn, Higgins went on to kick two goals on him and set one up and Milburn got taken off the ground. Although he is primarily a forward, Higgins has been used sometimes in the midfield. In 2009 Higgins was promoted into the Leadership group. And he received the famous number 7 that was worn by Scott West and Doug Hawkins before him. Higgins had a brilliant pre-season that was up there with Daniel Cross and Matthew Boyd in the time trials. He is touted as being a potential captain of the Club. He had a solid 2009 season but had hamstring troubles that put a damper on his performance. He has the ability of kicking both feet and has great speed. His most notable goal was against Geelong. He is a very fit onballer that can run all day. He signed a contract extension midway through the season. 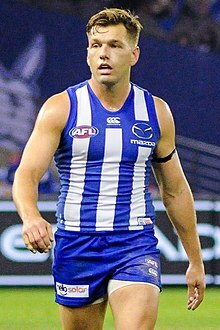 On 3 October 2014, Higgins signed with the North Melbourne Football Club as a restricted free agent after the Western Bulldogs decided not to match the Kangaroos' offer. Higgins had a stellar first season with North Melbourne, playing 24 games and kicking 39 goals. Higgins was also one of their most consistent players all year playing as a high half forward. The 2016 season however, was not one to remember for Higgins as he injured himself in round 7, thus ruling him out for three months. Higgins returned in round 23 and played in the losing elimination final. Higgins played every match for the 2017 season apart from the round five match against Fremantle to go on and win his first best and fairest, the Syd Barker Medal. Statistics are correct to the end of round 5, 2019. Higgins grew up in Geelong, Victoria. He attended St Joseph's College. He played junior football for Newtown and Chilwell and was a Geelong supporter. His father Mick played reserves football for Geelong. His sister Danielle Orr played netball for the Geelong Cougars in the Victorian Netball League and was a member of the Geelong AFL Women's team in 2019. In November 2015, Higgins married partner Heidi Greig. ^ Stevens, Mark (26 June 2009). "Cap fits Shaun Higgins". Herald Sun. News Corporation. Retrieved 20 January 2010. ^ Clark, Jay (15 September 2017). "Shaun Higgins wins North Melbourne best and fairest in close finish". Herald Sun. News Corp Australia. Retrieved 16 September 2017. ^ "Shaun Higgins". AFL Tables. Retrieved 25 March 2019. ^ Petrie, Andrea (19 August 2009). "Higgins to be a long-term Dog". The Age. Fairfax Media. Retrieved 21 January 2010. ^ "AFLW: How Cats, Kangas have built their lists". afl.com.au. Retrieved 2 February 2019. ^ "Wedding Bells Ring in Spring". AFLPA. Retrieved 28 May 2017. Wikimedia Commons has media related to Shaun Higgins.